Today’s tip will cover the wet felted join. This little marvel can be done as a wet felted join with any (non superwash) animal fibers. It works great on 100% animal fibers, but don’t count those blends out – experiment. It will depend on the grip of the blend. Every animal fiber has a different scale profile (with the exception of silk, the only protein fiber with no scales). 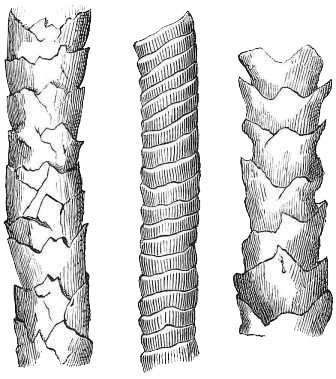 Some fibers have many small smooth scales, others have larger rough scales. It’s the scales of the animal protein fiber that grab onto each other. I’ve successfully wet felted blends with as little as 40% wool but it was a very grippy wool. The other thing I love is no WASTE!! When you are working with Cashmere, or your precious hand-spun and you want to use every last inch . . . When you get near the end of your ball of yarn, or need to add a new color (more on color change later), you can do your felted join. Make sure to leave yourself 10″ or so of the old ball, so you have enough room to maneuver, but once joined you can knit every inch of your yarn! Begin by cutting away 1/2 the plys of each end of yarn. I usually cut away about an inch. If you are working with a single ply you can untwist the yarn and pull away some of the ply. Many tutorials skip this step – don’t. If you just felt the two ends together you will get a fat bump in your yarn. Over lap the yarn tails together at around 1/2″ from the end. The overlap should be in the middle of the cutaway plys. Fold the cut away ply ends back on the yarn, so you create two interlocking loops. Wet your fingers a bit (yes I use spit . . . hence the other name of this join, “spit splice”) and twist the cut ends so they stick to the yarn. This will help control the main splice. 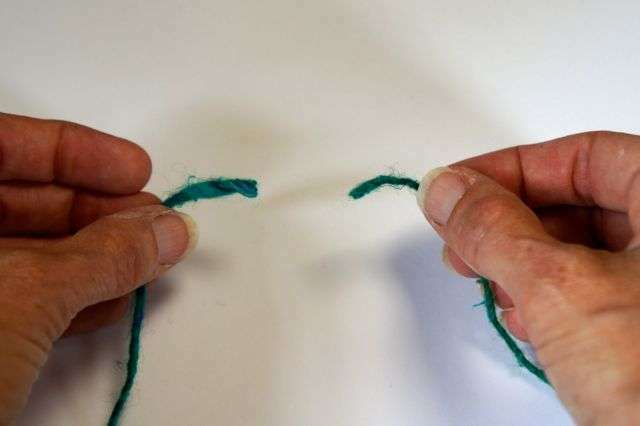 Once the ends have been twisted, you can put the overlapping loops in the palm of your hand, and add a bit more of the magical splicing ingredient – your spit. I usually just lick my palm before placing the ends in. Yeah, you heard me right, I lick my palm. What? I washed my hands first! Final step, rub your palms together until you start to feel some heat. Remember the magical ingredients to create felt, animal fiber + water + agitation = felt. Sometimes you’ll then get a bit of fuzz on either side of the join, just move the fuzzy part to the middle of you palm and give another little rub to smooth it down and . 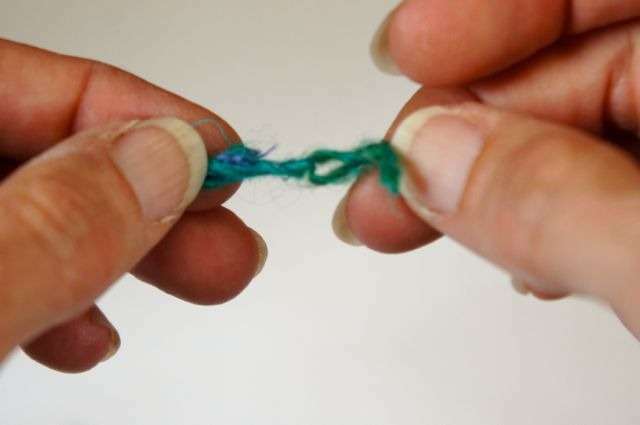 . .
Ta Da – two balls of yarn fused together as if they were one. Beautiful! 1) Work to the end of the row of color 1. 2) Pinch the yarn right at the last stitch, tight to the needle, and cut the yarn leaving just enough to grip (about a 1/2″ – 3/4″). Then unknit a few inches, so you have 6 – 10″ of the color 1 yarn free. 3) proceed to do the felted join. 4) Knit to the end of the row again with color 1 and color 2 will be joined right where you want it! An Introduction to Color Knitting: Learn Stripes and More!